Confirming an interview invitation from a company you applied to is very important and should not be taken for granted. The whole interview process will assess if you are able to do the job, if the job available is something that you are willing to do, and if you are the right fit for it. Personal interviews are even better than phone interviews because you will be able to interact better with the interviewers. When you attend an interview, you need to be prepared and have the right mental attitude. 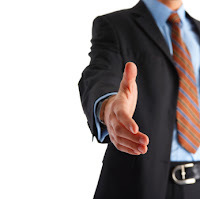 Below are some tips to guide you when you get an interview appointment. Nervousness or being jittery are common feelings experienced by a candidate during interview. Avoid feeling inadequate for the position you are applying to. The fact that you were requested for an interview means that you were pre-qualified by the recruiter based on your resume alone. It also means you have bested some of the other candidates for the position. Another way to gain confidence is to research information about the company before your interview. Gaining knowledge about the company would give you the confidence when you are asked what you know about the company. Treat every interview as a learning experience and a way to improve. If you have not been successful from your previous interviews, do not let it frustrate you. Try to remember what questions you had difficulty answering, and learn how to come up with a better answer. When similar questions are again asked, you will be prepared to come up with a better answer. Interviews can also be a way an opportunity to learn something about the company, other people and even your self. If you are given the chance to ask, do not be afraid to ask about the company or the position you are applying for. This will give the interviewer the impression that you are interested to learn more about their company. Being late for an appointment or failure to show up for an interview on an agreed time will create a negative impression against you. As a candidate, it is your responsibility to show up to an agreed schedule. If for some unforeseen reason, you will not be able to attend the interview, you must inform your interviewer 24 hours before the appointment. But make sure that you have a valid reason in resetting the appointment. One of the most singificant problems human beings face as a general population is how to handle stress. As a life & career expert, and an acclaimed advice columnist, I have compiled eleven of the most significant ways that you can reduce stress in your life. You may not always be able to make stress dissappear, but you can manage it with some very simple techniques. 1. Talk! Don't hold all your feelings within! Discuss your stressful feelings with someone you trust who will listen without being judgmental or pressuring you to their own point of view. Even if you can't change the immediate situation, talking about it helps alleviate some of the tension you may be feeling. Supplement the verbalizing with something physical: write it out, exercise or hit a pillow. 2. ACT! Be willing to take risk and make change, no matter how small. Try to change the stressful situation, or at least some part of it. Moving forward in small ways helps you feel empowered and in control. Put one foot in front of the other to move in a positive direction. Soon, the stress will lessen. 3. LISTEN TO YOUR BODY! If you learn about how your body reacts to stress, you can also learn how to counter that stress. Learn to listen to your body's signals and find ways to reduce your stress, even if it's just "taking five" to clear your mind. Relaxation exercises (E.g. Yoga, meditation, physical exercise) help, too. 5. 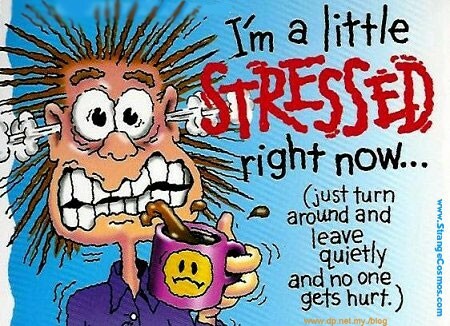 DON'T OVERWHELM YOURSELF: If you are stressed and overwhelmed, perhaps you are trying to handle too much. Rid yourself of extra duties that aren't necessary or important. Learn how to delegate and how to say "no" without feeling guilty. Ask for help if you need it. 7. PRIORITIZE: You may not be able to avoid all the responsibilities obligations you currently have, but you can learn how to complete them without resentment and consciously choose how you will handle them. 8. EXTEND YOURSELF: Make your own life better by making someone else's life better. Give of yourself. Volunteer! You will feel empowered, positive, important...and you will be! Visit http://www.volunteermatch.com and choose an organization you believe in! 10. SOCIALIZE: Spend time with family and friends for love and support. Don't be afraid to enjoy yourself! Appreciate friendship and let others know you care about them, too. Love may not conquer all, but it's a great start! 11. LEARN HOW TO BE HAPPY: One thing all of life's winners have in common is a sense of well-being, a positive attitude and realistic goals. Focus on the good things about yourself, and in your life. Nobody's perfect. Learn to enjoy the "little things" that make you happy. Count your blessings. Every day, write down on a slip of paper one thing you are grateful for, even if it's just a sunny day, a friend's phone call, your cat's happy purr. Put this "blessing" in a jar along with a dollar or more. Do this for one month. At the end of the month read all those slips of paper and you will realize that life is better than you think! Use the money to do something really special for yourself, or donate it to charity.